Gosaikunda trek is acclaimed to investigate Red Panda an imperil creature of Nepal Himalayas. The hike to Gosaikunda lakes simply located in north side from Kathmandu city, the main capital town of Nepal. 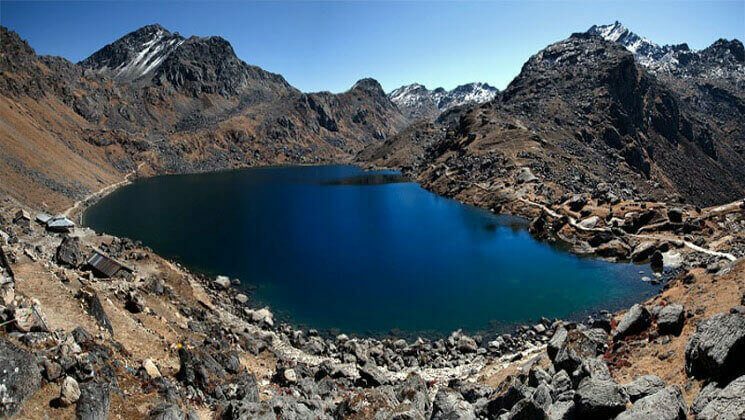 Majestic Gosaikunda lakes trek is soft adventure trek visiting frequently by Nepali trekkers. Neighborhood individuals have been created present-day lodges with current offices in a vast part of the spots. In the event that you need me to state reality, I should state that you can total gosaikunda pass trek – 7 days or in 8 days with taking enough rest. You can cross Suryakunda hill station and the majestic lakes in all months in all season. Hiking in winter time, such as in December, January and February stays more snow and the trail isn’t straightforward in perspective of sleeper, cold and messy wet, yet the lodges are opening. Hike Lauribinala with visiting Gosaikunda lakes presents a great incentive with fantastic Mountain vistas, splendid scenes incorporating clean lodges with great sustenances. In particular, yet it is less crowded hiking trail but demanding treks of langtang region. As an outcome, Gosaikunda is a blessed lake, an imperative hiking journey goal for Hindus and Buddhist consequently numerous individuals visit this place normally. Other than that, you can hikes over moraine and stone rocks to Suryakunda lake 4,630m/15,140 feet and plunge downhill walking to Helambu region. Langtang National Park is the natural surroundings of a few wild creatures, for an example, Himalayan mountain bear, Musk deer, Himalayan wild goat and especially flying creatures and wildflowers. Besides, at spring, the trail secured with assortments of elevated wildflowers and the woods are multi-shaded with bright rhododendron, orchids, magnolia, and numerous other botanical species. Moreover, trek into the March, April, May and June mark as the best a very long time to visit in the spring season. The trail is clear and rich with magnificent Sun shinning atmosphere. In addition, September, October, November addresses the best time to visit too as far as the best climate. Hiking at gosaikunda pass is increasingly delightful as a result of best atmosphere, remarkable Mountain view, wild orchids blooms, and clear lakes. Trek gosaikunda in those months, you can see various trekkers along the routes. Besides that, you will have the best perspective of Langtang Lirung (7246m), Gangchhenpo (6388m), Dokpu (5930m), Naya Kangri (5846m), Yala Peak (5500m) and numerous others snow-topped mountains, tough rocks, verdant grounds, forested green valleys and just as heavenly mountain lakes. Helambu trek is similarly mainstream for its characteristic magnificence and awesome atmosphere with sublime perspectives of glorious snow-shrouded mountains and just as Tibetan Buddhism culture. The territory is occupied by Sherpa and other ethnic gatherings having Buddhist Gompas. Gosaikunda trek 7 days detail itinerary. Hike to Gosainkunda lakes and Suryakunda viewpoint includes the pristine glacial pounds along the rocky moraine trail until Suryakunda Phedi. Do not miss to get an excellent mountain vistas from Suryakunda hill top. Crossing pass, you can walk downhill to get Phedi. The particular route is designed for world explorer who hikes over suryakunda pass with glacial lakes but is walking to get an adventure experience within a short span of time than this itinerary would be the best. Have a breakfast at the hotel, drive few minutes to catch up coach for Dunche Bazaar with your mountain trekking guide and porters. Enjoy six our scenic drive through Trishuli town with beautiful tiny villages, river valley and mountains. The bus stops roughly about 30 minutes on highway restaurants for lunch in Trisuli. Than you reached at Dunche bazaar around 2 o’clock midday. Stay overnight in lodge. We proceed with stroll through woods incorporates a considerable staircase, in the wake of hiking for around 30 minutes, it’s moving up for around 3 hours until you reach Deurali tea shop. The following stop if Dhimsa, a couple of hours later passing woods of oak, hemlock, and firs, we reach at Chandanbari or Singompa. Trek constant towards Cholangpati, hike through the backwoods of Oak, Hemlock and Firs. At that point we walk rise to the Lauribina la slope (3,920 meters) station where the best perspective of Gosainkunda lakes (4,460m. ), Himal Chuli (7,893m.,) Manaslu (8,156m,), Ganesh Himal (7,406m.) and numerous other littler snow secured mountains are hanging tight to see us. On a sunny morning, even the Annapurna range can be seen ascending delicately behind. Toward the north, we would see Langtang Lirung. The trail leads to the northern side of Gosaikunda Lake, crosses a moraine, passing three more small lakes; you will reach Laurebina La (4,610m / 15,121 ft). The trail descends to a National Park Post at Bhera Goth (4,240m) and to Phedi (3,740m). From Phedi the route drops and climbs through scrub bamboo to Dupichaur (3,630m) and descends finally to Ghopte. Stay overnight at guest house in Ghopte vir. The trek proceeds with the forested edge moving to Thodang Betini (2,260m) and to Chipling (2,170m). Making an exceptionally steep plummet the trail heads to Pati Bhanjyang (1,860m), a Brahman and Chhetri town. At that point the trail continues to Chisapani where you can be seen the mountain sees and the dawn over the Himalaya. Remain medium-term at visitor house in Chisapani. From Chisopani hill station, the route goes forward through the forest of oak and rhododendron and brings you to Borlang Bhanjyang (2,440m). After a while, you will get to the Army check post where your Shivapuri entrance permit is checked, then to Mulkharka (1,800m) from where you will have a spectacular view of Kathmandu valley. Descending through the forest you will reach Sundarijal where there is a large water project. Furthermore, we drive out to the city center of Kathmandu. And at evening drop you to the TIA international airport KATHMANDU for your further flight. How much does Gosaikunda trek 7 days cost? Hike to Gosainkunda pass 7 or 8 days is available now on USD 598 per person is standard trek price on double occupancy basis. But of course, the trip price will vary according to group size. 1 night twin sharing tourist standard accommodation in Kathmandu with breakfast. Question: Do I need the experience to do Gosaikunda trek? Question: How do I get drinking water on Gosaikunda trek? Answer: In this trek route, you can get telephone services as well as internet services as well. Answer: We provide porters to transfer your luggage. As we are a responsible trekking tour operator agency, each of our porters carries maximum 25 kilo of your backpack which means 2 guests (12.5 kg luggage of each guest): 1 porter basis. If you wish to have a private porter, you might also get it on paying an extra cost. Question: Is it possible to rent a guide? how to hire a gosaikunda lake trek guide? My husband and I trekked to the amazing Langtang gosaikunda to Helambu scenic trek in November 2016 with kamal our guide through Gokyo Treks and Expedition. Ammar organised everything for us with perfection. We stayed at Ammar’s home after arriving in Kathmandu. What a nice welcoming.